For the responsible horse owner, understanding how vitamins and minerals work together to keep horses healthy is crucial. While their main dish generally consists of grass or hay with some feed, a trace mineral block provides horses essential nutrients their diet may otherwise lack. Like humans, horses need vitamins for proper growth and development. A trace mineral block provides some of the most essential horse vitamins. For instance, calcium and phosphorus in trace mineral blocks help promote healthy teeth and bones. The magnesium in them helps maintain healthy nervous tissue and muscle function. Potassium is an electrolyte in the blocks that helps balance the acid in cells. Without these vitamins lameness, eating dirt, weight loss, loss of appetite and a dull coat may occur. Trace minerals are also important to horses in several ways. 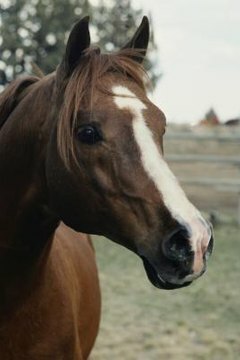 For instance, copper helps the body use iron, and cobalt helps the horse use B12. Zinc promotes healthy bones, skin, hooves and connective tissue. Manganese helps in the production of cartilage and selenium helps build muscle. Iodine in trace mineral blocks helps mares cycle regularly and prevents the formation of goiters, or an enlarged thyroid. When lacking the proper minerals, a horse may show signs of slow growth as a foal or may develop crumbly, weak hooves or anemia as an adult. Salt, or sodium, is the major electrolyte provided through the trace mineral block. Salt helps regulate the body fluids many horses lose while sweating. A lack of salt in a horse’s diet may cause a decrease in eating or drinking. Also, the horse lacking salt in his diet may lick various items, like sweaty tack. Without proper salt intake, he may suffer from dehydration. Since vitamins and minerals are a requirement for a healthy horse, providing a trace mineral block for the horse to lick is an added bonus when combined with a good feeding regimen. Purina Mills recommends placing the block in a covered area where the horse has unlimited access and in a tub or mineral feeder that keeps the block off the ground. If a horse shows any signs of a vitamin or mineral deficiency, a veterinarian can perform blood work to determine what is lacking and what steps are needed to improve the equine's health. Alberta Agriculture and Rural Development: My Horse Needs Minerals, but Which Ones?